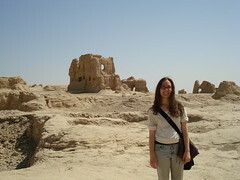 Hannah just got back from spending her spring break in Xinjiang (the far west portion of China). She was originally planning on going to Tibet, but, when things deteriorated there, she was forced to change plans. Though there were some stories of unrest and riots in Xinjiang as well, she had a great trip and made it safely back to east China (the part with all the giant cities and factories). It sounds like quite the place, containing giant mountains and the second lowest place on the face on the planet. She even got to drive along the silk road! But I won’t say anymore. That way she’ll be able to tell you her stories herself. 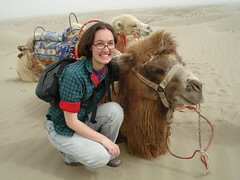 She was nice enough to let me co-opt two pictures from her week in Xinjiang to post here, the one above and one with a pair of Bactrian Camels (the two humped kind).